It was one of those days at work where I didn’t even want to care. Ever have those? Some days I don’t care, but I wish I did; some days I just couldn’t have been less present. As I was sent out on assignment to my neck of the woods, I figured I would take a long lunch and try somewhere that I wouldn’t necessarily get the opportunity to try (other people’s tastes, wallets, etc) and when I checked out the lunch menu online… oooh la la. 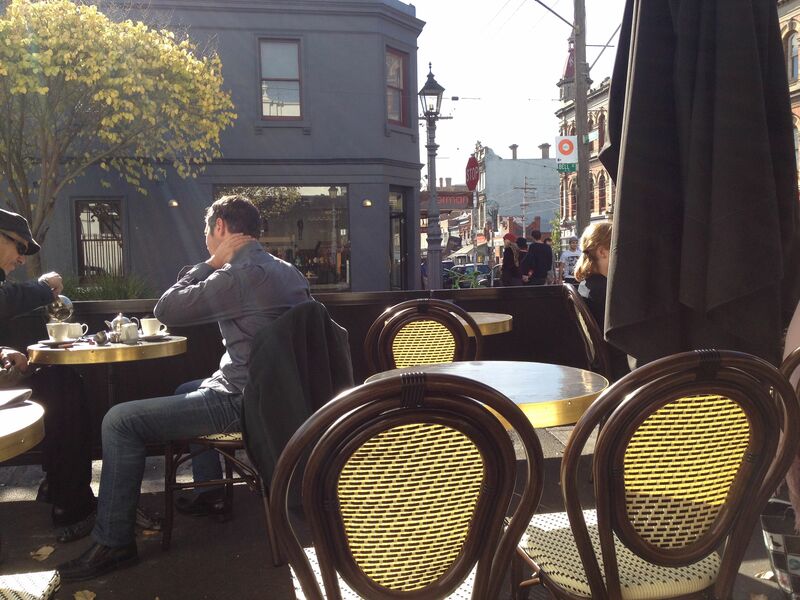 Madame Sousou takes up a corner on Brunswick Street (back toward the city from Johnston Street) with a good number of outdoor seats from which to watch the passers-by, like any good restaurant in Paris. On a sunny Friday this is absolute heaven. Table for one, with my book? Don’t mind if I do. The Lunch menu is brilliantly simple (and very traditionally French) and we have two price options if you’re up for a deal and a meal – $35 for two courses and a glass of wine, $45 for three courses and a glass of wine. I went all out: 3 courses for me. 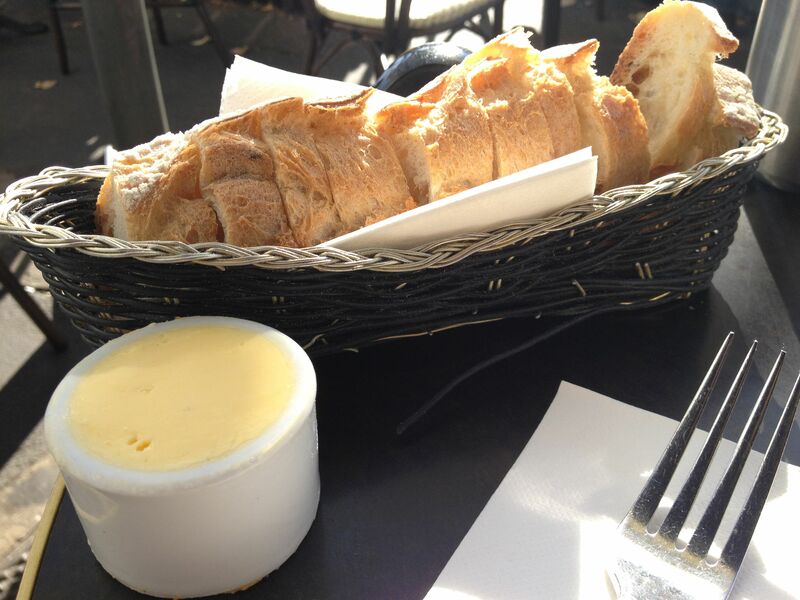 That was AFTER the bread and butter. First order of the day was actually the most difficult decision – should I go for the onion soup ($15 stand alone), Salade Composée ($17) or the terrine ($12) with housemade pickles? 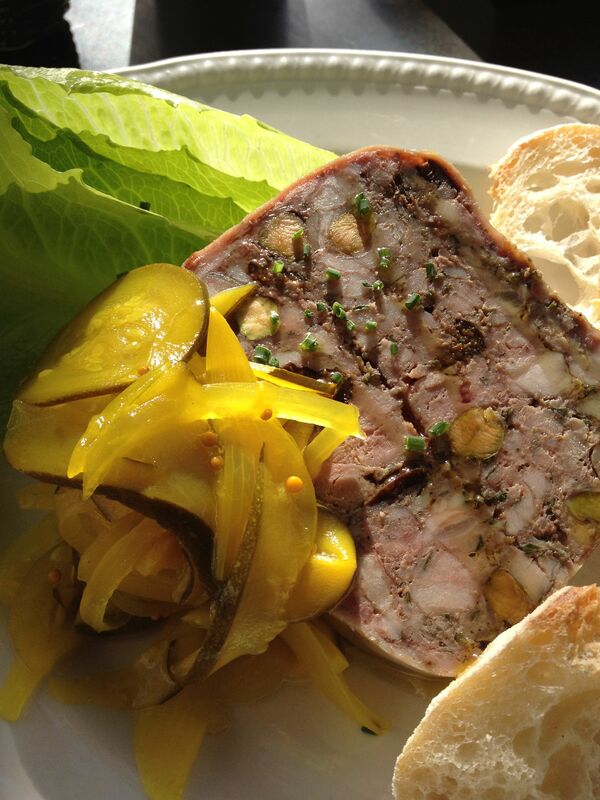 The terrine came out on top with the tried and true method of decision making (that’s eeny-meeny-miney-mo when you’re by yourself) and was an exceptionally good choice, bursting with fruit and nuts and hints of rabbit. The only slightly disappointing part was the bread (the same as the one above) which had so many holes I could’ve used it for a game of mini-golf. The pickles were ridiculously delicious. 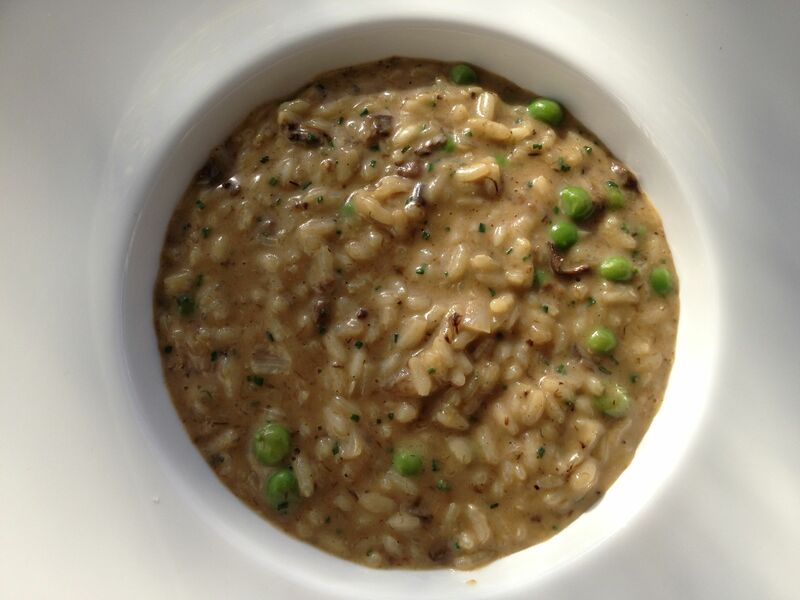 If you weren’t starting to get full from looking at all that bread, the heavyness of the mushroom and pea risotto ($27 alone) might fill you up. It was quite a small serving (yes, the edge of the plate extends beyond the scope of the picture) but it certainly didn’t need to be any larger… I was bursting by the time I licked the last morsels from my fork. It was exceedingly rich and very earthy, with the beautiful mushroom flavour prevailing. With this dish, my wine was going down a treat. How could I not order dessert, after the immense pleasure I had with my two choices so far? The menu offers up a brulee ($14), tarte tatin ($15) and burnt orange chocolate mousse ($14). I’m getting shivers just typing that. As the menu suggested I allow 25 minutes for the tarte tatin, that was the vice of the day (as if the lunch wasn’t enough). 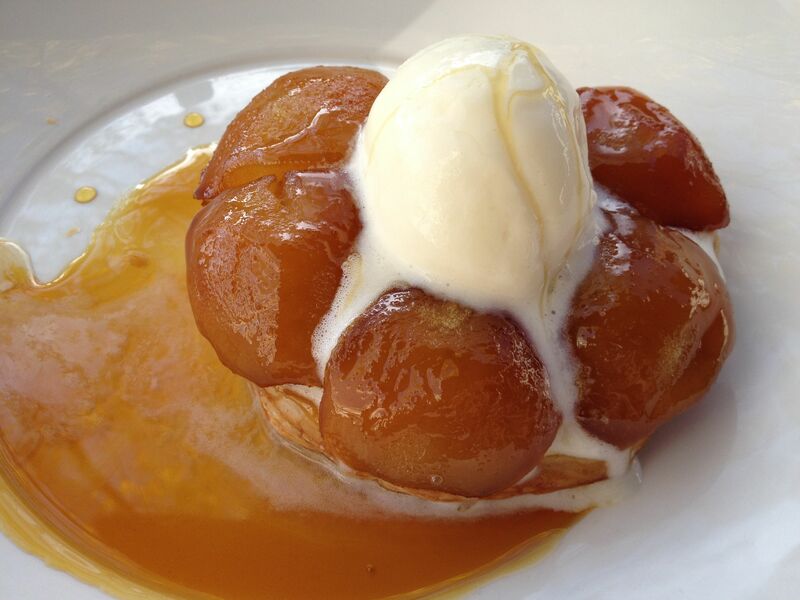 Astoundingly rich pears soaked in saffron, drizzled with honey atop the tart base. I ate the whole damn thing. I must’ve reached my absolute stomach capacity, but by god – it was worth it! Now, you’ve heard me rave on about the food, but I must mention that the service was quite sub-par. I was paying above city prices (even at $45 this meal is still a little rich, each dish alone I feel has at least a decent mark-up) but I was being served by young students who, although they were fairly attentive, weren’t knowledgeable at all and gave off an air of ‘I’m serving breakfast at a sub and sandwich cafe’. For those prices, I demand REAL French people. 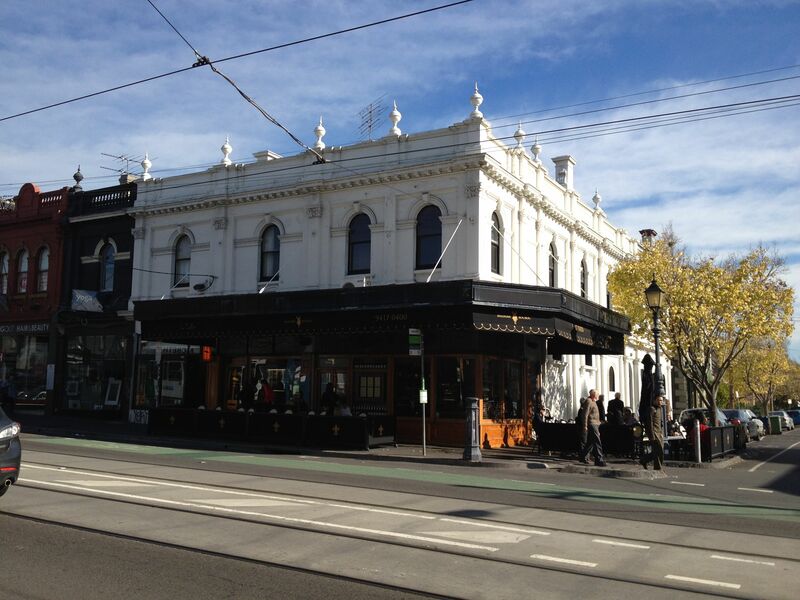 This entry was posted on Thursday, July 5th, 2012 at 2:00 pm	and tagged with bread, breakfast, brunswick street, dessert, fitzroy, french, lunch, outdoor, risotto, terrine and posted in Breakfast and Lunch Reviews, Restaurant Review. You can follow any responses to this entry through the RSS 2.0 feed.